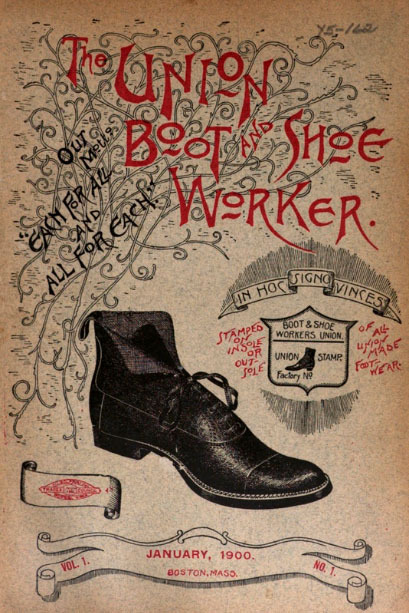 Illustration from The Union boot and shoe worker, 1900-1902. Courtesy of University of Wisconsin via HathiTrust. Check out this great new online exhibit featuring the Massachusetts show industry, courtesy of the Digital Public Library of America (DPLA). The DPLA has created several online exhibitions with material from collections all over the U.S. There are some great topics, like Activism in the US, a History of US Public Libraries, and Patent Medicine Advertisements. 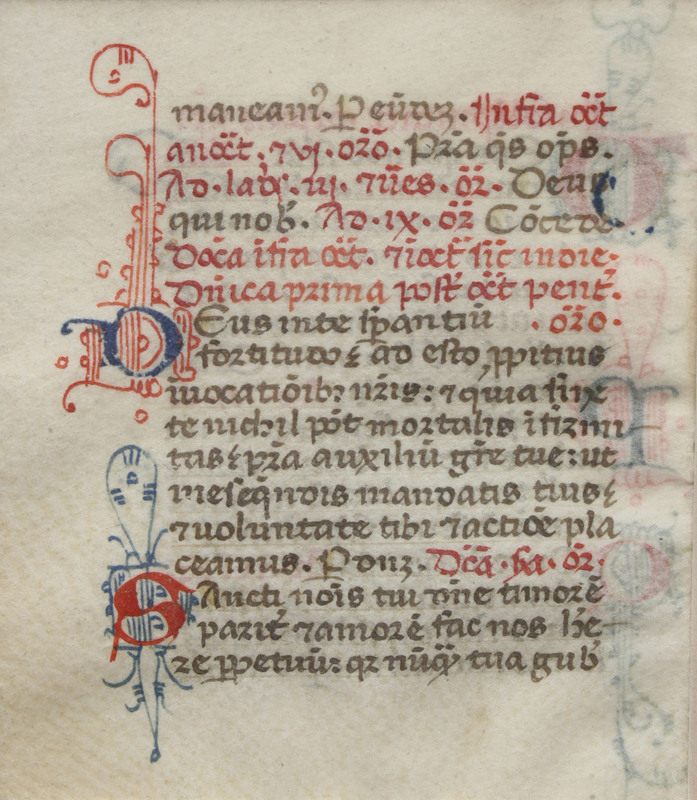 A leaf from an Italian breviary manuscript, rubricated on both sides and dating from about 1450. The 3 inch tall page has five rubricated initials. The definition of a miniature book depends on who is asked. In the United States, many collectors feel that a miniature book is usually considered to be one which is no more than three inches (7.5 cm) in height, width, or thickness. Some aficionados collect slightly larger books while others specialize in even smaller sizes. Outside of the United States, books up to four inches are considered miniature by many. The Library of Congress determined a miniature book to be one smaller than 4 inches (10 cm) in spine height. The books in this exhibit represent a variety of sizes. From 4 inches to one of the smallest in the world at .0394 inches (1 mm). All of the books on display are “real” books, with pages that turn and with text and images on the pages, or sample pages from real books. This exhibition is on loan from Joseph Curran, former President of the Miniature Book Society of America, and is in honor of the 2014 Book Fair of the Miniature Book Society, which is free and open to the public on Sunday, August 17th from 12:00 to 4:00 p.m. at the Taj Boston Hotel. 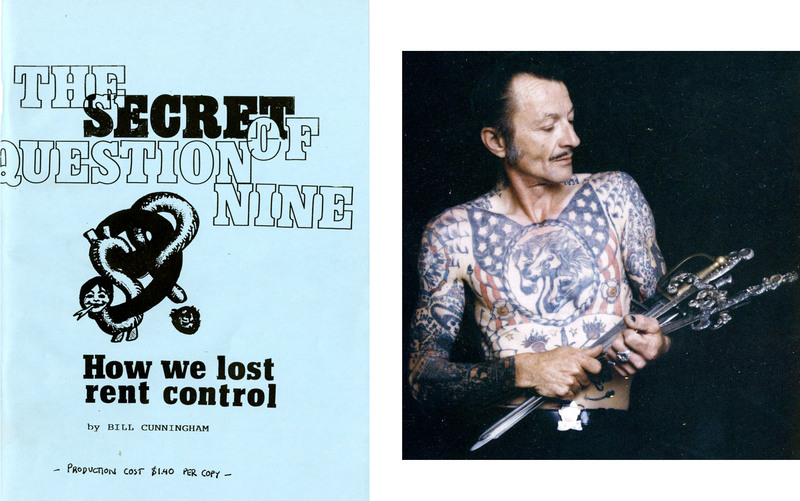 On left: The Secret of Question Nine: How We Lost Rent Control by Bill Cunningham, 1996. On right: Don Leslie, world renowned sword swallower and native Cantabrigian. 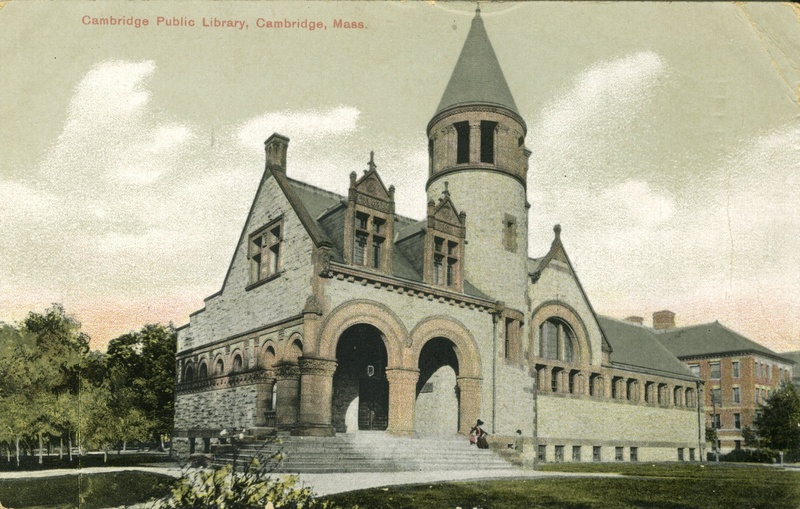 The Cambridge Room, the Library’s Archives and Special Collections, has a vast collection of books on every subject imaginable about Cambridge, Massachusetts. We’ve selected a few of our favorites – featuring bohemians, activists, hippies, teetotalers, revelers, restaurateurs, writers, design gurus, and urban planners. With titles like, Peaking through the hole of a Bagel, Lewd, and Baby Let me Follow you Down – what’s not to love. These books are rare gems – one of a kind – in our collection and touch on the vast and unusual history of Cambridge. Stop by the Cambridge Room on the second floor for more recommendations. Exhibition Location: The Sakey Room on the first floor of the original Library building. 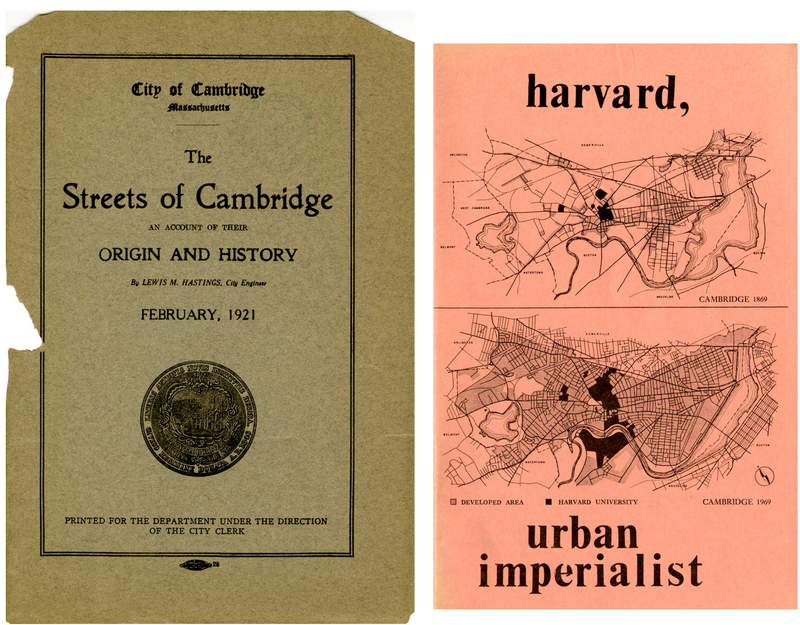 On left: The Streets of Cambridge: An Account of their Origins and History by Lewis M. Hastings, City Engineer, 1921. On right: Harvard, Urban Imperialist by the Anti Expansion Anti ROTC Strike Steering Committee, 1969. From lovingly recreated maps of Cambridge circa 1700 to rioting students in the 1960s, and from proposed demolition of neighborhoods to detailed plans of the urban landscape, this exhibition displays documents that show the ways in which the streets of Cambridge have been both a cause of celebration as well as a place of political contest. Built in 1818 by the Commonwealth on what was then called Captain’s Island, Cambridgeport’s powder magazine was used to store state and private gun powder and ammunition. Once the magazine was operational, the “way to Captain’s Island” was renamed Magazine Street. During the first half of the 19th Century, the building served as a magazine and was guarded by the Independent Corps of Cadets at the outbreak of the Civil War. 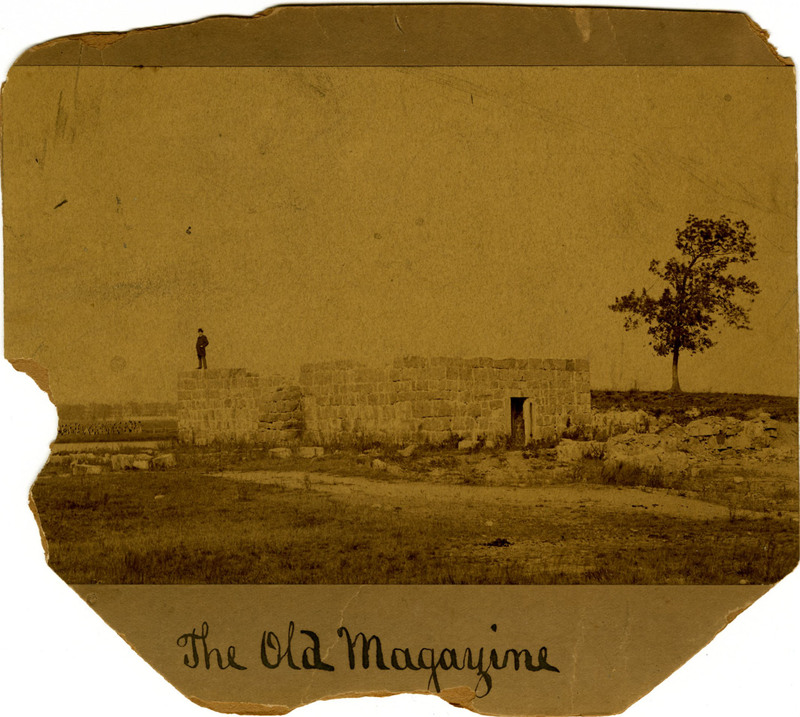 In 1863 after a response to a citizen petition, the magazine ceased to store public powder, beginning a decades-long decline into disrepair. In the late 1890s, the City of Cambridge decided to create a park with access to a swimming beach along the banks of the Charles River and hired the Olmstead Brothers to redesign the “old magazine” as a bath house. In 1899, the bath house opened – electric lights were installed for dusk dips in the Charles and three life guards were placed on duty until the park closed at 9 o’clock in the evening. By 1901, 60,000 people visited the park annually. After the Charles River was declared too polluted to swim in the 1950s, three public swimming pools were built along with a new bath house. The historic bath house was converted to a garage for use by park workers and has since fallen into disuse. The Cambridgeport Neighborhood Association is currently working with the Massachusetts Department of Conservation and Recreation to restore the “old magazine” as part of an effort to revitalize Magazine Beach. For updates on the project, please visit magazinebeach.wordpress.com. 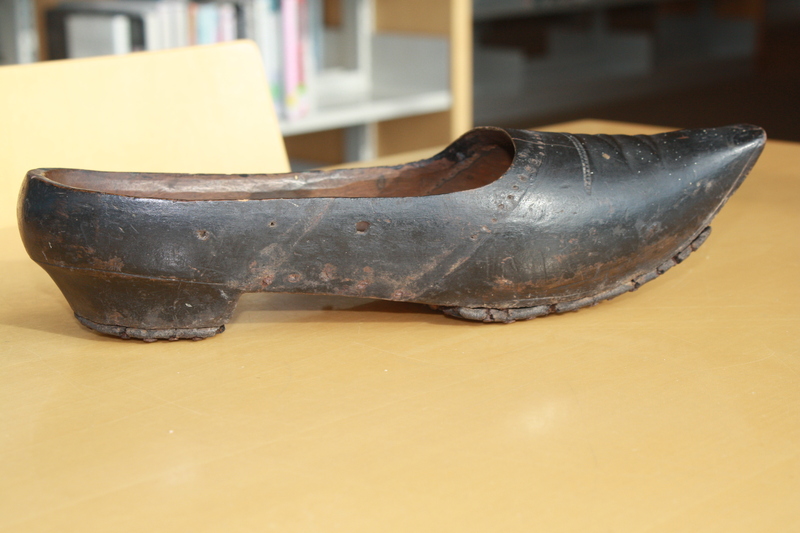 Sabot, from the Cambridge Historical Objects, Cambridge Room, Archives and Special Collections. n. heavy work shoe worn by European peasants, especially in France and the Low Countries. There are two kinds of sabots: one is shaped and hollowed from a single piece of wood (called klompen by the Dutch); the other is a heavy leather shoe with a wooden sole. v. deliberate destruction of property or slowing down of work with the intention of damaging a business or economic system or weakening a government or nation in a time of national emergency. The word is said to date from a French railway strike of 1910 when workers destroyed the wooden shoes (sabots) that held the rails in place. A few years later sabotage was employed in the United States in the form of slowdowns, particularly in situations that made a strike untenable—such as by migratory workers whose employment was temporary. origin. The sabot on display has a slight heel with detailed carvings across the front and side, reminiscent of leather creasing and patterning. Nail stubs line the bottom of the shoe. There is no known provenance or chronology of custody other than an old card catalog claiming that it came from the John Snelling Popkin Estate, which was located on Massachusetts Avenue near the Cambridge Common. Popkin (1792- 1852) was a professor of Greek at Harvard University.